Καλό Πάσχα: Happy Easter: Frohe Ostern | O'Really? Whatever your inclination, it’s difficult to ignore that sandwiched between the Vernal equinox and Beltane, it’s Easter time already. So Happy Easter, Frohe Ostern or Καλό Πάσχα, as they say down south, to all readers of this O’Really? blog. If you’re gorging yourself on chocolate (see picture right), you might like to consider the food science behind it all thanks to a book  by Stephen Beckett published by the Royal Society of Chemistry. Ever wondered why melted chocolate that is put back in the fridge doesn’t quite taste the same? This book will tell you, and a whole lot more besides. 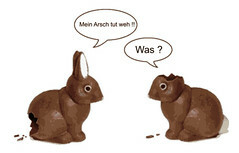 As for the chocolate bunnies, my language skills (german and greek) are a load of old arsch, but the cartoon over on the right roughly translates as follows.